Photographer Amy Martin captures Grand Canyon Yoga as Laura connects the earth and sky. When I lead Grand Canyon yoga sessions, it is both effortless and challenging. However, this is the way I like to live my life. I always search for the balance between these two views. The quiet that surrounds you constantly makes it easy to be in the moment you are in…. no sounds of traffic, cell phone chatter, and machinery to distract you from the subtle yet profoundly simple sounds of the river, the wind, laughter, and at times…. nothingness. Thereby, putting all things in perspective. We are merely a part of the world; we don’t dominate it, at least not down in Grand Canyon. Our actions and even our thoughts are dictated by the elements we immerse ourselves into- sand, rock, rain, sunshine, water, and wind. They determine our next move. As is often said, you can’t always control what happens, just your reaction to it. Every moment in the Grand Canyon you get to practice that. What do you do when a huge thunderstorm hits your camp just before dinner and you were supposed to cook steaks on the grill? Sounds simple, sounds clear. But, it is an opportunity to find the beauty in what is around you and surrender to the earth, rather than fight or avoid it. You can’t really avoid it. Now add the element of practicing and teaching yoga. It takes the experience of being present and choosing to love where you are to a whole new level. When standing on a wide-open beach at camp in a yoga circle with new friends and colleagues- as I look around I cannot help but smile. Furthermore, I see their willingness to really experience the time down in the Grand Canyon, delve into ‘who we are’ and discover what we can do mentally as well as physically. There is no place more rewarding to practice and teach yoga- I am not distracted, the participants aren’t distracted. Consequently, we leap into any adventure presented and ready for anything. There are so many instances where on day one someone finds out that I teach yoga, day two we do a session for those immediately interested, and by day three the entire group is practicing together- regardless of if they have done yoga before and what their past experience or knowledge was of yoga- crew, passengers, everyone. There is a built in ability to try new things and want to self-reflect that happens in environments like Grand Canyon more so than in the yoga studios of the world. And then, we get to take that perspective and experience home, to the studio, to our mat, to our daily lives. I feel so fortunate that I am able to continue my practice and my teaching while guiding on the river. Finally, my two worlds are melding into one, more and more each year. Take it up one more notch…. the Grand Canyon yoga river adventure. Now that is mind blowing. Check out my 5 Minute Sleeping Bag Series II. I have compiled 10 stretches that I suggest as part of your daily self-care routine on your raft adventure. 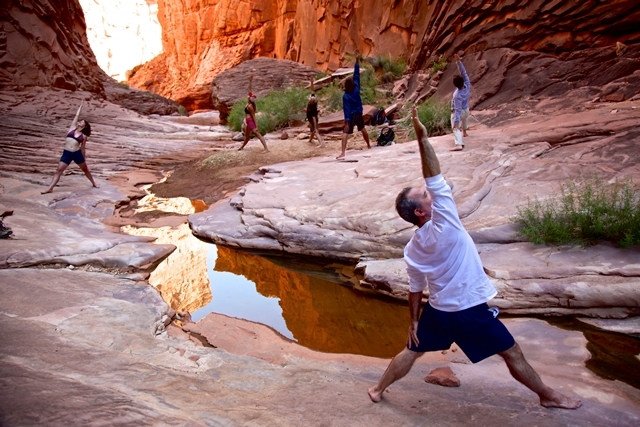 Or, even better, join me on an AzRA Grand Canyon yoga adventure! I’d love to meet you! 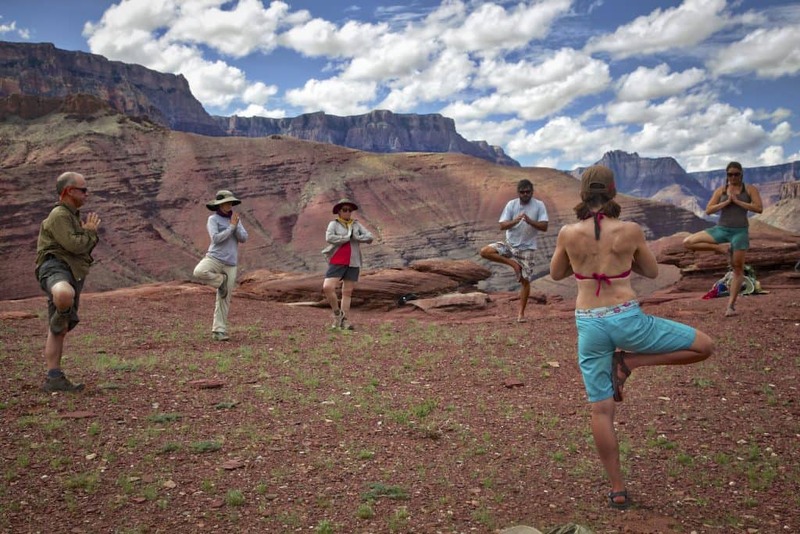 Grand Canyon yoga sessions could be on the beach, on an overlook or even in a side canyon. Photo by Amy Martin. Main photo above of guide and guests practicing yoga on hike. By Amy Martin.